Why is Apex the best place to live? One of the top reasons my clients are choosing Apex is the great selection of new homes. Priced from the $350’s to a million, there is something for everyone. A charming Main Street with coffee shops and restaurants. Lots of parks, including a Sports Park, Nature Park and even a Skateboard Park. Family friendly street fairs and holiday activities. 15 minutes to the RDU Airport and Research Triangle Park. Really good shopping including Costco and Beaver Creek commons. Neighborhoods with community pools and activities. Many of my clients call me about Cary and then ask, what about Apex? Apex is a separate little town in Wake County (the town part is little but the area of Apex is 15 sq miles and that’s pretty big.) There are around 45,000 people living in the town. As a result of available land for development and the number of building permits to be issued, the town planning department figures there will be approximately 60,000 residents when the town is built out. I think of the dividing line between Cary and Apex to be just above HWY 64, a 4 lane road leading to RT. 1 North to Raleigh and South to parts of Apex and Holly Springs. The transition between Cary and Apex isn’t clear. Apex looks just like Cary until you cross hwy 64 and then Apex looks more rural. It won’t be for long. The pastures and fields are filled with survey stakes. How is Apex different from Cary? It’s not that different. Both have small downtowns. Really just one street. The Town of Apex is more charming (just my opinion) with a few restaurants, shops, sidewalk cafes etc. Cary’s downtown isn’t really a destination. 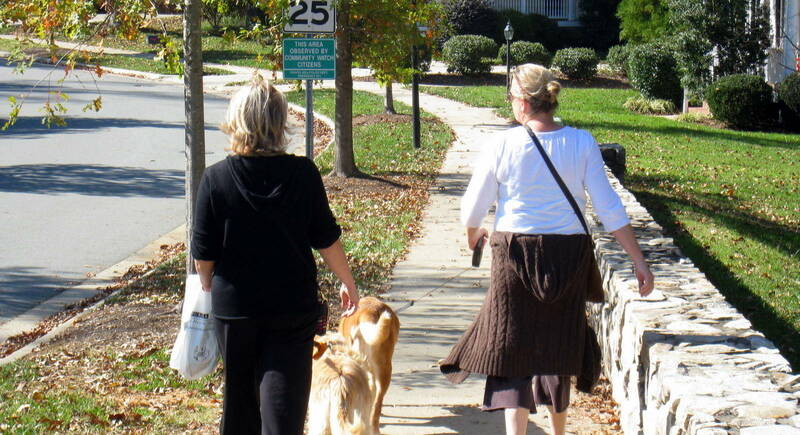 The charm of Cary is in the wide manicured parkways, parks and greenways, and newness. Apex is where Cary was around 15 years ago on a smaller scale. In 2000 there were around 100,000 people living in Cary and now there are 150,000. Cary is basically built out and the few new developments are expensive. Supply and demand. Parts of Cary looked rural a few years ago just like Apex now. You would be surprised if I showed you where just last year there were donkeys on a farm right in the middle of new neighborhoods in Cary. The donkeys are gone now and the site has new custom homes selling in the $700,000 up. I took this video a couple of weeks ago as I was leaving a beautiful new development. That’s what it’s like in Apex. You think you are out in the country but behind all of those trees are new homes. Apex is part of the Wake County School District, the 15th largest school district in the country. It’s a county wide system so there really isn’t an Apex school district. The schools in the area are good. There is a crossover with Cary and Holly Springs so your address doesn’t mean you will definitely go to a school with Apex in the name. Your school could be located in Holly Springs or Cary. That doesn’t mean a long bus ride. The towns are irregularly shaped and adjacent to each other. Your address may be Apex but your Cary school could be 2 blocks away. Here is a quick comparison of elementary schools basically in Apex. You can find lots of detailed school information on this site. There is a new high school in Apex in an area with lots of new development. This year 2015-2016 the Apex Friendship High School opened with 9th and 10th graders. Students came from Holly Springs, Apex and Panther Creek High Schools. Apex High is an older school and will be renovated next year. A new school is opening in Cary, Green Level High in 2016-2017. The Apex High students will go there for the first year while Apex High is renovated. They then will go back to Apex High. Green Level will open for 9th and 10th graders in West Cary in 2017-2018. Some students with an Apex address may also be districted to Green Level. Apex Friendship Middle School will open in August 2018. These two new schools are a huge draw for this part of Apex. It’s where a lot of the new construction is going on. This is a really good interactive Town development map. It shows what’s under construction, approved planned and proposed. Here are some new developments with links to the builder sites. Many of the builders start with a base price and most buyers add 15-20% in lot premiums and upgrades. If you buy an inventory home under construction the upgrades are added into the price. Often there are upgrades in an inventory home that would cost more if you were to build. Remember, I can represent you with new construction and the builder pays my fee. See my post about why you need a buyers agent for new construction. Scotts Mill has a community pool and play area with homes in the 300’s -mid 400’s. Homes built in late 90’s and early 2000’s. Many of the homes in the $250,000 to $350 price range have a Apex address but are located in the Holly Springs area. In the areas near Cary there are many homes under $350,000 in adjacent neighborhoods around the Beaver Creek Shopping Center, a very convenient location because it’s near I-50 and a quick trip to RTP and the RDU airport. Where do I start? There are so many new neighborhoods coming out of the ground. Even so, supply hasn’t kept up with demand and I see sold signs lining the new streets even before any homes are built. Builders usually have homes in other neighborhoods to show for presales (that’s when you pick a lot and plan and build). If you want to build be sure and have a buyers agent. Parkside Bella Casa Huge neighborhood almost built out. Add 20% from the base price for design center options and lot premiums for a presale. Inventory homes have options priced in. There are three pools for Parkside and Siena at Bella Casa. Bella Casa is right down the street from Apex Friendship High School and Apex Middle School (under construction). Right next to Bella Casa is the apex Nature Park and the Apex Sports Park. Madison Great builder. All inclusive and custom. Small neighborhood just starting. Arcadia Ridge Just getting started photo Feb 2016. Now December 2016 and they just have a couple of homes left. Many were presales. The models are still open because Pulte is building some of the same plans in Cary on Green Hope School Rd. Woodcreek is in the Holly Springs area of Apex. There are great amenities and even a lazy river. MI/Homes and John Wieland have been building single family homes.There are resales as well as new construction. Wieland recently sold their Triangle lots to Pulte but are operating under the Wieland name. Prices are in the 300’s to 600’s. Townhomes around $300,000.